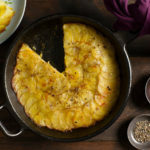 This stunning layered potato cake with fragrant saffron makes an impressive presentation at any meal. Preheat oven to 425˚F (220˚C). Stir clarified butter with saffron; steep for 5 minutes. Brush 9-inch (23 cm) cast iron skillet with 4 tsp (20 mL) saffron butter. Starting in centre of pan, arrange slices, overlapping slightly in concentric circles to cover bottom of pan. Brush with some more of the saffron butter and season with pinch of salt and pepper. Repeat layers twice. Brush remaining butter over top. Pour vegetable broth over top and sprinkle with remaining salt and pepper. Preheat oven to 350°F (180˚C). Place skillet over medium-high heat; cook for about 10 minutes or until butter starts to sizzle. Cover and bake, uncovered, for about 50 minutes or until potatoes are tender and golden brown. Let stand for 10 minutes. Run small paring knife or spatula around edge to loosen. Carefully invert onto serving plate. Sprinkle with chives. Cut into wedges. To clarify butter, melt butter in a small, heavy-bottom saucepan set over low heat. Remove pan from heat and let stand for 3 minutes. Skim froth from top with a ladle; slowly pour butter into a measuring cup, leaving milk solids in bottom of pan. Discard solids. Serve with sour cream or crème fraîche.